The NSFR is one of the key Basel III reforms to promote a more resilient banking sector through structural changes in the liquidity risk profiles of banks that will reduce the likelihood that disruptions to a bank’s regular sources of funding will erode its liquidity position in a way that would increase the risk of its failure and potentially lead to broader systemic stress. Specifically, the NSFR is intended to limit over-reliance by banks on short-term wholesale funding during times of buoyant market liquidity, by forcing banks away from short-term funding mismatches and towards longer-term funding of longer-term and less liquid assets and business activities. The NSFR is designed to complement the Liquidity Coverage Ratio (LCR) and reinforce other supervisory efforts. Whereas the LCR focuses on cashflow behaviour under multiple general liquidity stresses (market liquidity risk) over a short term of 30 days, the NSFR looks at the resilience of the asset and liability structure of the balance sheet under firm-specific stresses (funding liquidity risk) over a medium-term timeframe of one year. Among other things, the NSFR is intended to offset incentives for bank to fund their stock of high-quality liquid assets (HQLAs) with short-term funds that mature just outside the 30-day horizon of the LCR. type of asset (which can be capital, deposits, wholesale funding, short positions or net derivatives payables). quality and liquidity (which depends on whether it is encumbered, ease of sale or use as collateral, LCR status and credit rating). the policy objective of ensuring continued lending to the real economy by requiring a minimum degree of stable funding for such lending. If a bank funds itself from a category in the ASF column and lends to a category in the RSF column with the same weighting, then the NSFR is 100%. 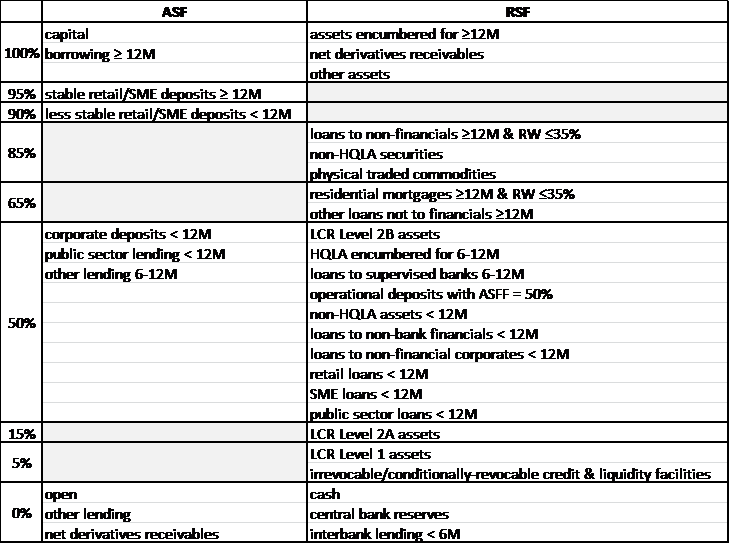 However, if a bank funds itself from a category in the ASF column and lends to a category in the RSF column with a lower weighting (which will be in a lower row), then the NSFR would be less than 100% and there would be a net stable funding requirement, which the bank would need to cover by borrowing from a higher category. No distinction is drawn by the NSFR between unsecured and secured lending. Both are assigned RSF factors on the basis of the type of counterparty and the term of lending. However, because the collateral on the balance sheet of the seller is regarded as ‘encumbered’ (unless the repo is with a central bank), repos are subject to enhanced RSF factors, Where the encumbrance (the term of the repo) is for more than six months but less than one year, assets which otherwise would have RSF factors of 50% or less, are assigned RSF factors of 50%. Encumbrance of more than one year pushes the RSF factor to 100%. A key target of the NSFR is interbank maturity transformation. This is penalised, unless it takes place within discrete bands: overnight to six months; over six months to one year; and over one year. Thus, if a bank borrows (1) on an open basis or (2) for less than six months from another bank and lends for less than six months to a third bank, the ASF factor is 0% and the RSF factor is 0%. This means that, although the borrowing is regarded as completely unstable, the lending does not need any stable funding, so there is no net stable funding requirement. The NSFR therefore allows interbank maturity mismatches anywhere between overnight and six months. Similarly, interbank maturity transformation is also allowed without penalty between six months and one year. If lending to banks for more than six months is funded by borrowing of more than six months from other banks or financials, there would be an ASF factor of 50% and a matching RSF factor of 50%. And there is no NSFR penalty on lending to banks and other financials for more than one year, if it is funded by borrowing (from anyone) for more than one year or from capital. The ASF and RSF factors would then both be 100%. If, in contrast, a bank borrows (1) on an open basis or (2) for less than six months from another bank and lends for more than six months to a third bank, the ASF factor is still 0% but the RSF factor rises to (1) 50% for loans of between six months and one year and (2) 100% for loans longer than a year. That means the borrowing is regarded as completely unstable, while the loan is deemed sufficiently illiquid to require 50% or 100% stable funding. There would therefore be a 50% or 100% net stable funding requirement. In other words, the NSFR penalises interbank maturity transformation of across the six-month horizon. In the repo market, the estimated penalties for borrowing (1) on an open basis or (2) for less than six months from another bank and lending to a third bank for between six and 12 months is shown in the table. Maturity transformation by banks is tolerated, if funding is from non-financials. Thus, there is no penalty on lending to banks for more than six months and funding with deposits of less than one year — that is, maturity transformation anywhere between overnight and one year — provided the funding is from corporates, sovereigns, PSEs or development banks. In this case, there would be an ASF factor of 50% and a matching RSF factor of 50%. The NSFR encourages ‘reverse maturity transformation’ strategies — borrowing long and lending short. Thus, a net stable funding surplus is created by lending to (1) banks for less than six months or (2) central banks for any term, if it is funded from longer-term borrowing from banks. Such funding for between six months and one year would benefit from an ASF factor of 50%, well above the RSF factor of 0%. A similar net stable funding surplus is created by lending to (1) banks for less than six months or (2) central banks for any term (RSF factor of 0%), if it is funded from borrowing for less than one year from non-financials (ASF factor of 50%). There is an even larger net stable funding surplus in lending to anyone for less than one year, if funded from capital or by borrowing from anyone else for more than one year. The ASF factor would be 100% and the RSF factor would between 0% and 100% (depending on the type of counterparty and term). Another target of the NSFR is maturity transformation in the bank funding of NBFIs, including hedge funds. Thus, lending for less than one year to non-banks, including NBFIs, is penalised if it is funded from banks for six months or less (open or term). The RSF factor would be 50% and the ASF factor 0%. Perversely, this penalty applies even if the maturities of the borrowing and lending are matched at six months or below, or if a bank borrowed interbank for six months and lent to non-bank customers for as short as overnight. On the other hand, lending for up to one year to an NBFI (as well as to a corporate with a Basel II risk weight of no more than 35%, sovereign, PSE or central bank) is not penalised, if it is funded with (1) interbank borrowing of between six months and one year or (2) with deposits of less than one year from other non-financials. The ASF and RSF factors would then both be 50%. deposits from non-bank financial institutions (NBFI) for between six and 12 months. In other words, one-half of the above types of funding are stable and this proportion can be included in the numerator of the NSFR. a range of official entities (sovereigns, PSEs and central banks — but not national and multilateral development banks) for less than 12 months. This means that one-half of these assets are illiquid and require stable funding, so have to be included in the denominator of the NSFR. So, if a bank borrows from a customer in the first list and lends to a customer in the second, a 50% ASF-weighted liability in the numerator is matched by the 50% RSF-weighted asset in the denominator. The NSFR is 100% and there is therefore no net stable funding requirement. However, the NSFR imposes the same one year barrier on maturity transformation between non-banks as it does interbank. Thus, lending for more than 12 months to corporates (which have 65% or 85% RSF factors, depending on whether they qualify for a Basel II risk weight of less or more than 35%) needs to be funded from capital or by borrowing for more than one year (100% ASF factors). And so does lending for more than one year to other non-financials (100% RSF factors). The table below summarises the impact of the NSFR on cost of intermediation by banks. It sets out pairs of ASF and RSF factors for each key combination of unsecured or secured borrowing and lending category. For example, borrowing for less than six month from a financial institution (top row) and lending to an NBFI (fourth column) is shown as 0:50, meaning an ASF factor of 0% and an RSF factor of 50%. Where the RSF factor is higher than the ASF factor, there is a net stable funding requirement. Cells in the table have been colour-coded: red shows net stable funding requirements; white shows neutral positions; orange and yellow shows net stable funding surpluses. Relative ASF/RSF factors will clearly discourage some combinations of borrowing and lending. The likely segmentation of the money market is illustrated in the following copy of the previous table. The ‘funding-liquidity channels’ encouraged by the NSFR are marked out as green boxes, which link funding sources on the left with optimum assets in the top rows (the channels flow right, then up). The NSFR adds a cost to all securities purchases funded with repo or equivalent securities financing transactions (SFTs) —- or with unsecured fundung. Thus, if a bank funds a long position in securities with a repo of less than six months (ASF factor = 0%), it will incur a net stable funding requirement equal to the relevant RSF factor. However, because collateral used in a repo is encumbered, RSF factors are increased for repos of more than six months (unless with central banks). The degree of enhancement depends on whether the term of the encumbrance/repo is more or less than one year. The changes to the RSF factors are summarised in the table below. The next table summarises the impact of the NSFR on securities financing by setting out the pairs of ASF and RSF factors for each key combination of funding and collateral. Relative ASF/RSF factors will clearly discourage some combinations. The likely segmentation of the securities financing market is illustrated in the following copy of the previous table. Once again, the funding-liquidity channels encouraged by the NSFR are marked out as green boxes. OTC equity — financed entirely with one-year repos. The cost depends upon how much it would cost to raise funding with an ASF factor that balances the net stable funding requirement created by the leveraged securities position. This would have to be done by borrowing unsecured or from capital. The cheapest option is probably unsecured borrowing from another bank for one year. This type of funding has an ASF factor of 100%. The extra cost would depend upon the slope of the unsecured yield curve between the term of the position and one year. Strictly-speaking, the cost of the curve risk should be included.